Epsom Salt is named after a saline spring at Epsom in Surrey, England. It’s not technically a salt, but rather a naturally occurring pure mineral compound comprised of magnesium and sulfate. Epsom salt has a lot of health applications. It’s very popular for mineral baths that help to replenish magnesium in the body. However, there are also many uses for Epsom salt in the garden. This article shares 10 different uses for Epsom salt in the garden. Some of them are really helpful. Use Epsom salt to reduce transplant shock when you move a plant from a smaller pot to a larger pot. Grow larger, fuller roses by strategically adding Epsom salt to the soil 3 different times. 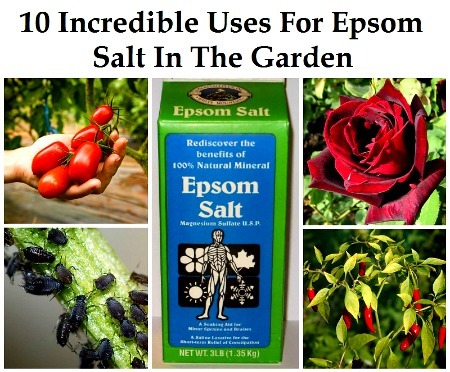 Click on the 10 Incredible Uses for Epsom Salt in the Garden link below to see all 10 garden uses for Epsom salt.